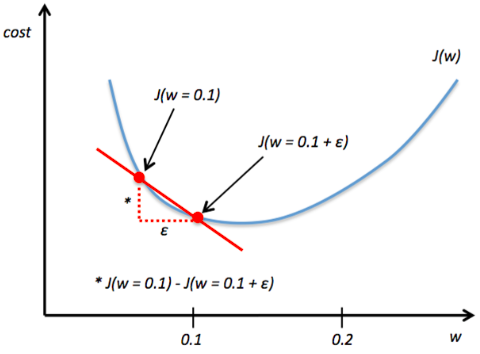 Troubleshooting Neural Networks: What is Wrong When My Error Increases? An overview of some of the things that could lead to an increased error rate in neural network implementations. There are many possible reasons that could explain this problem. There could be a technical explanation -- we implemented backpropagation incorrectly -- or, we chose a learning rate that was too high, which in turn let to the problem that we were overshooting the local minima of the cost function. The first thing I would always do is implementing "gradient checking" to make sure that the implementation is correct. Gradient checking is very easy to implement, and it is a good first diagnostic; here, we just compare the analytical solution to a numerically approximated gradient. Relative error <= 1e-7: everything is okay! Relative error <= 1e-4: the condition is problematic, and we should look into it. Next, we want to check if the data has been scaled appropriately. E.g., if we use stochastic gradient descent and initialized our weights to small random numbers around zero, let's make sure that the features are standardized accordingly (mean = 0 and std deviation=1, which are the properties of a standard normal distribution). Also, let's make sure that we are shuffling the training set prior to every pass over the training set to avoid cycles in stochastic gradient descent. Bio: Sebastian Raschka is a 'Data Scientist' and Machine Learning enthusiast with a big passion for Python & open source. Author of 'Python Machine Learning'. Michigan State University.